Over 100 Ready family members attended the first-ever mass reunion on Sat., August 11. Beginning with breakfast at the Readyville Mill, tours then took both visitors and home folks to the Charles Ready home and grave and the James Ready cabin and Gaither Graveyard nearby where he is buried. Charles Ready, of course, founded the village of Readyville and James, his nephew, settled at the end of what is now the Dewey Bryson Road, off Locke's Creek, and served in the War of 1812. 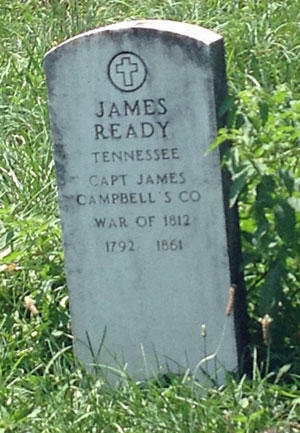 Most Readys in the Middle Tennessee area are descended from James and his second wife, Lucretia Caruthers. The Readys then gathered at the Cannon Inn where they shared family information and celebrated the 334 years of this family being in the U.S. They snacked on foods prepared from recipes from the Ready Cookbook and concluded the day with a dinner served at the Inn. The organizers, Larry, Ron and Mike Ready, say that with the interest and enthusiasm shown in this event, they are looking forward to having a similar gathering every year. More family members will be encouraged to attend. If you are a Ready family member or are interested in information about Readys, contact the family at ReadyFamily@webtv.net or call 256-303-2380. Great report of an organized and fun celebration with Ready family members! Brings to mind the question of how many more War of 1812 veterans we have buried in Cannon County. During this 200'th anniversary of this war, it would be interesting to see some effort to commemorate those early settlers who volunteered to protect their families and frontier homes. Many from Cannon County served in this war. Perhaps the Cannon County Historical Society is doing something appropriate for such a commemoration? Thank you James Ready for your service! James Carnahan, also a veteran of the War of 1812, is buried at Curlee Cemetery. His gravestone has crumbled away, as have those of his other, close relatives. I am working to get a new stone from the U.S. Government for him (as I did in the 1960s for James Ready), but am having some difficulty.